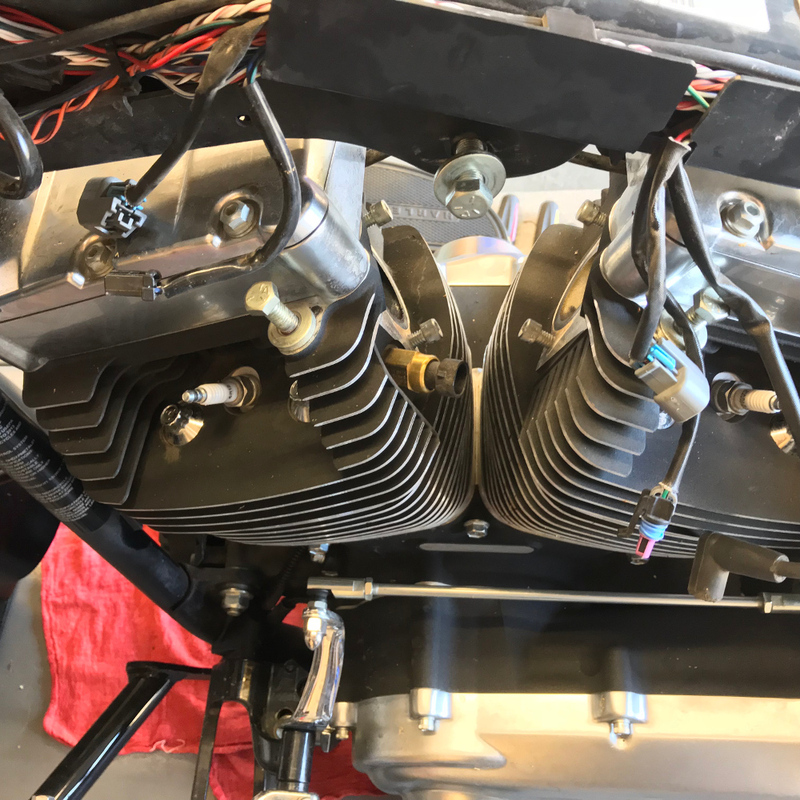 We can recap our previous day’s removal 0f cylinder heads, cylinders and pistons or see how we began this project from the start! 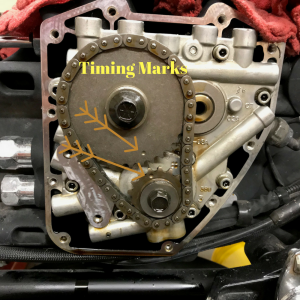 Today we can dig into the timing components. 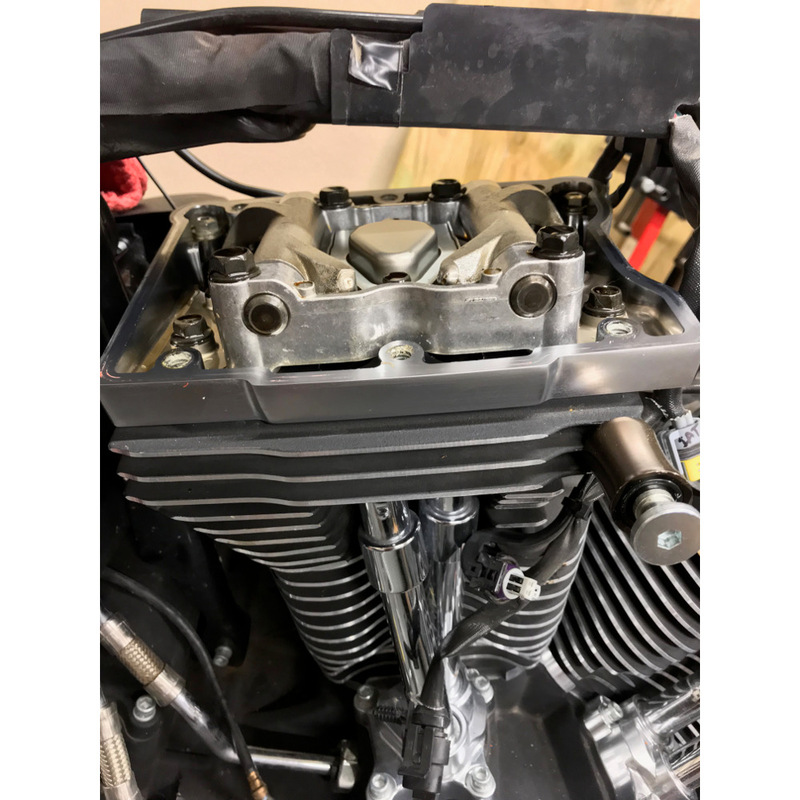 Remove the timing cover using a 3/16″ Allen head tool. The points cover does not require removal to perform this step. 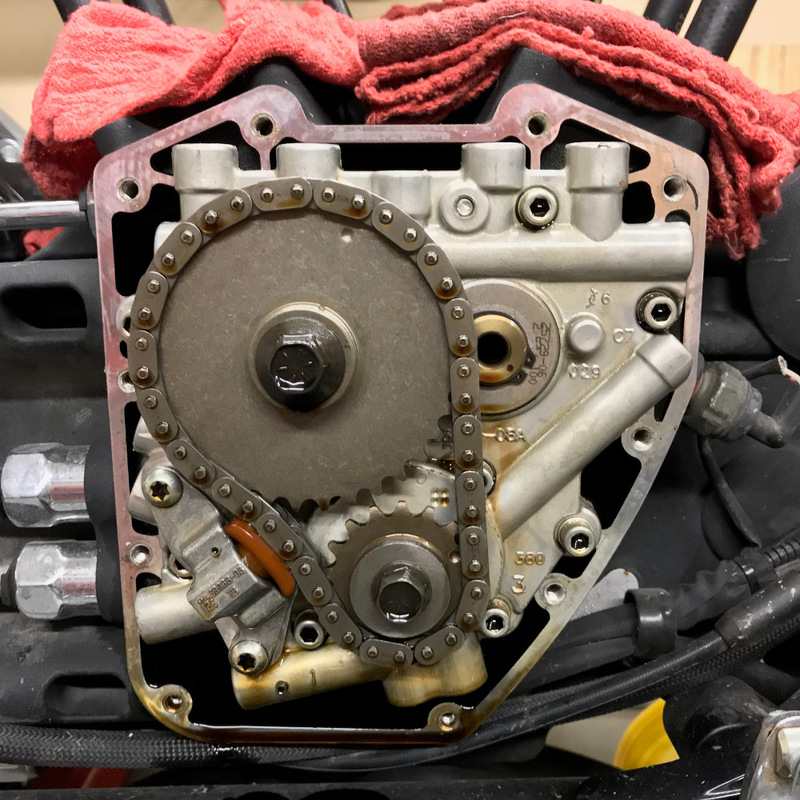 With the cover out of the way, we can remove the timing chain tensioner using a paper clip to hold the tensioner in the compressed position. 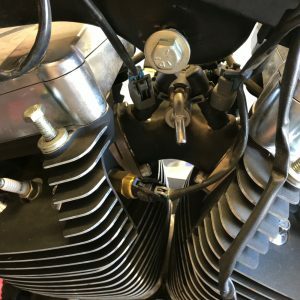 Two Torx bolts and off it comes. 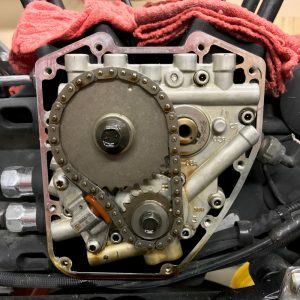 To remove the sprockets, I used a Delrin Cam Gear Holding tool available from Georges-Garage part # 320620. 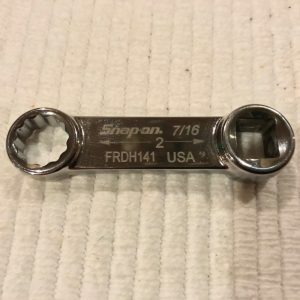 Works perfectly without damage to any components. Both sprockets are indexed and can only go onto their respective shafts one way (Timing marks facing out). 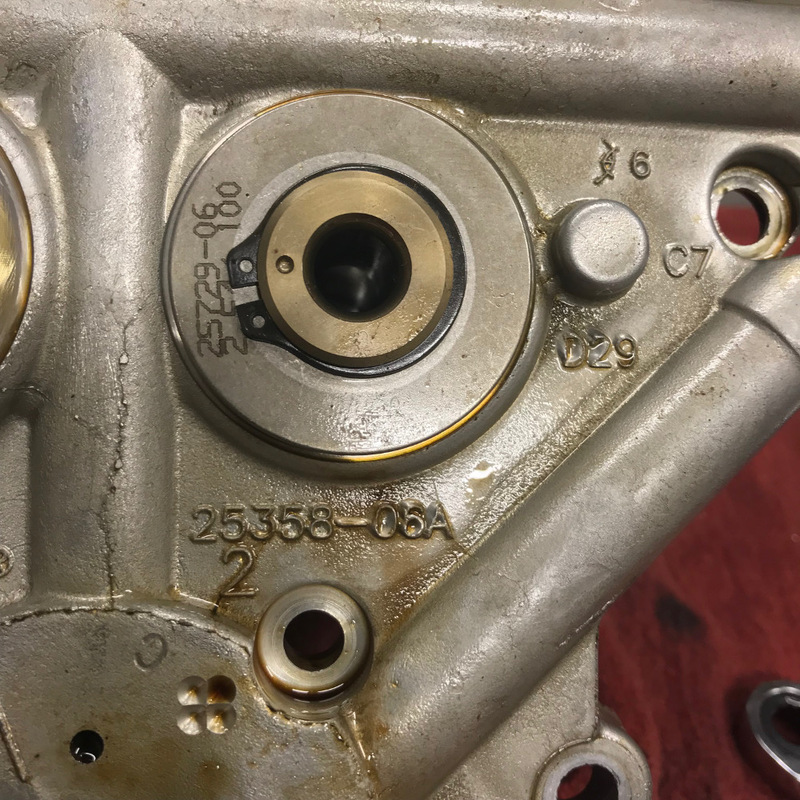 In the photos below we see the cam support plate with the timing gear set removed. 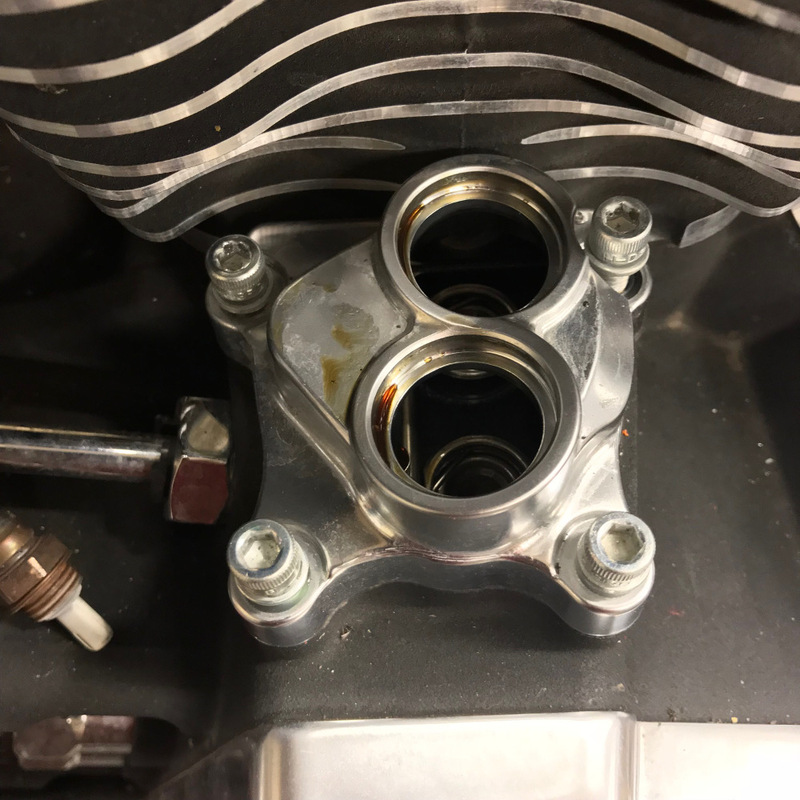 Over each of the two cam shafts are spacers that must not be swapped and need to be returned to their respective shafts. 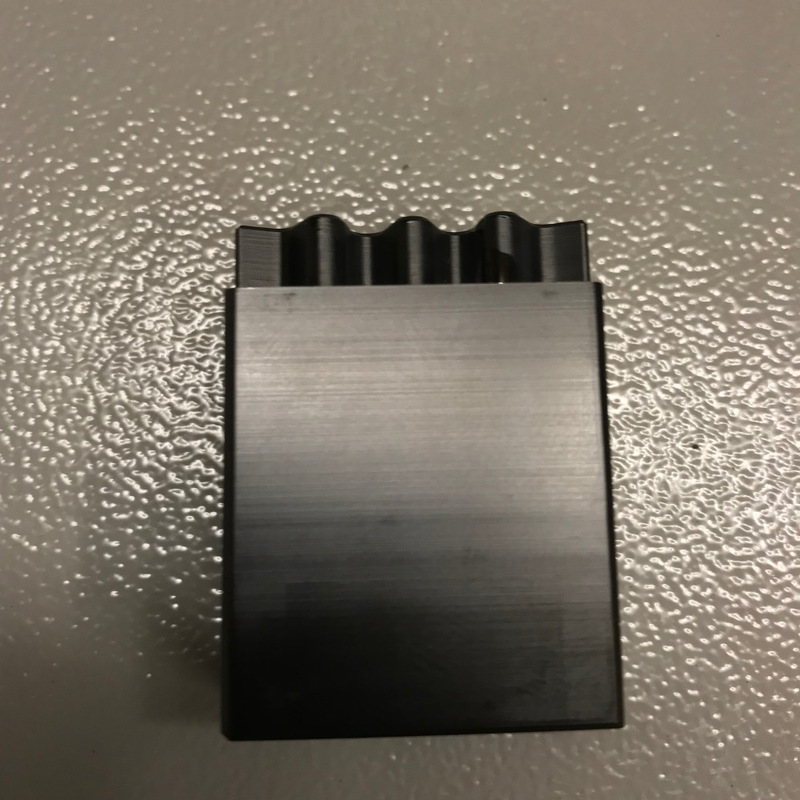 A closer look reveals each shim (spacer) is imprinted with the shims thickness. A picture here is a life saver, should you, by chance, mix them up or drop them unintentionally. Notice the snap ring is on the front head camshaft only. 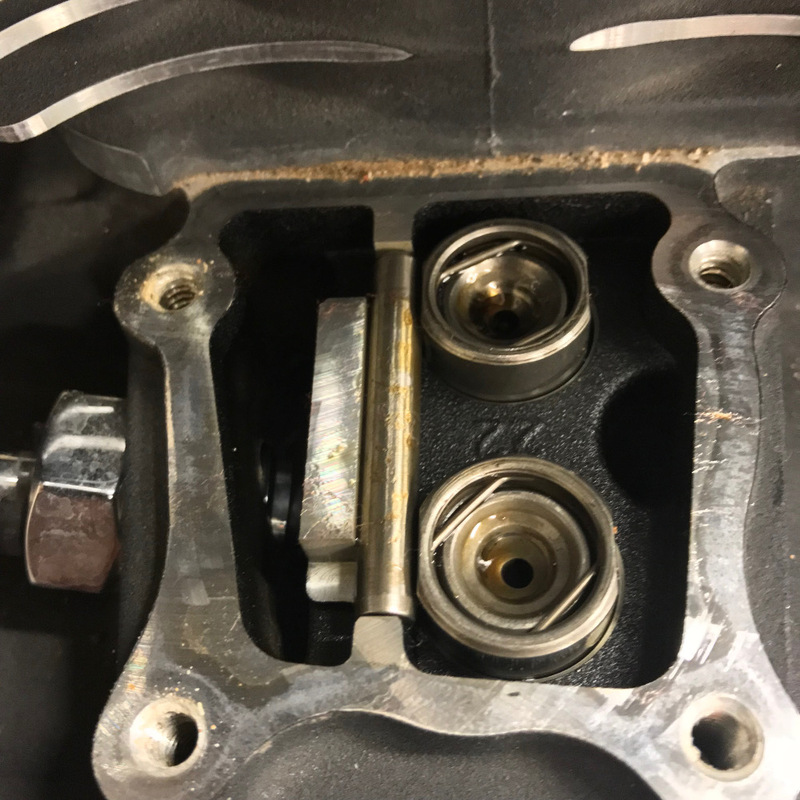 It must be removed to release the cam from the support plate. 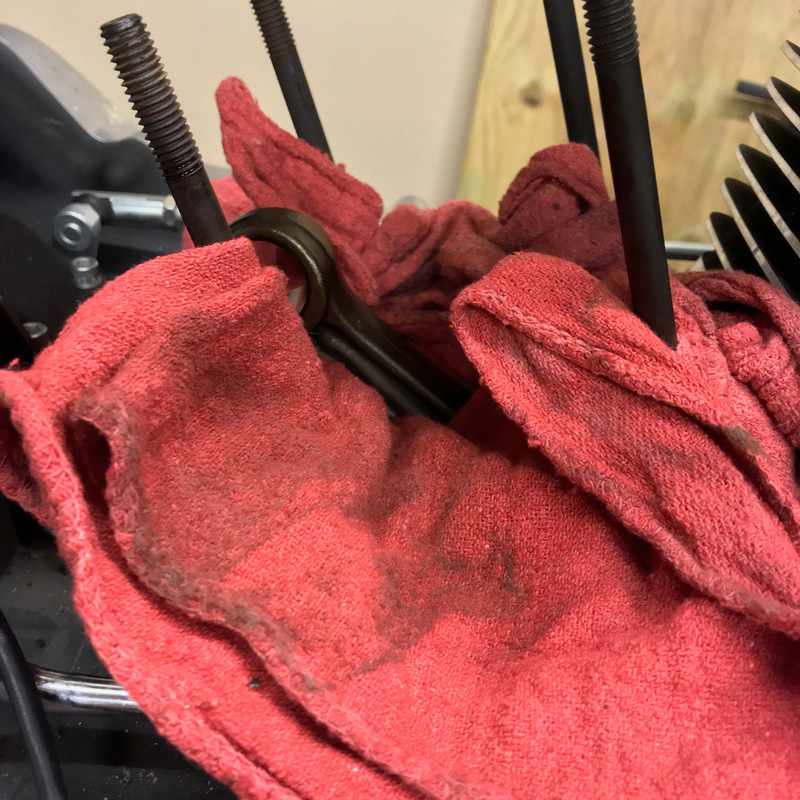 Again, in quarter turn increments, we loosen the 3/16″ Allen Head bolts until we can spin & remove them by hand. The two right pictures below are close ups of the shims and their respective thickness. 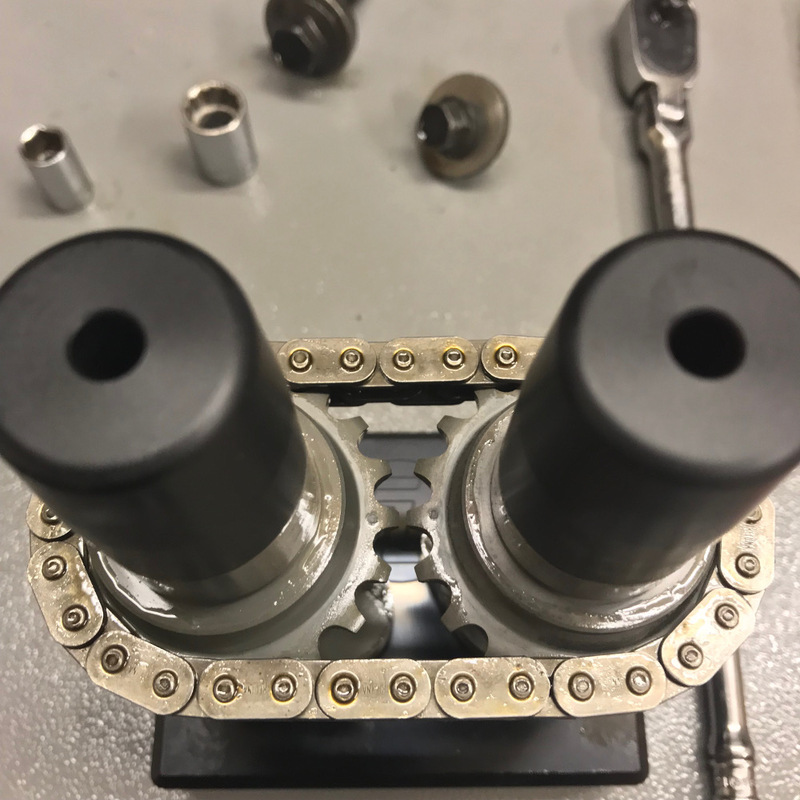 Once the Allen bolts, snap ring and shims are removed, we can gently tap the cam support plate with a mallet and it will separate from the inner timing cover. 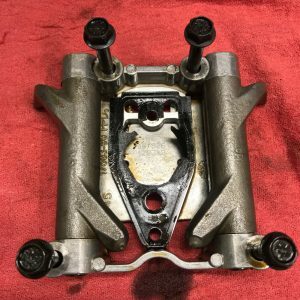 Now we’ll take a look at the inner side of the cam support plate. 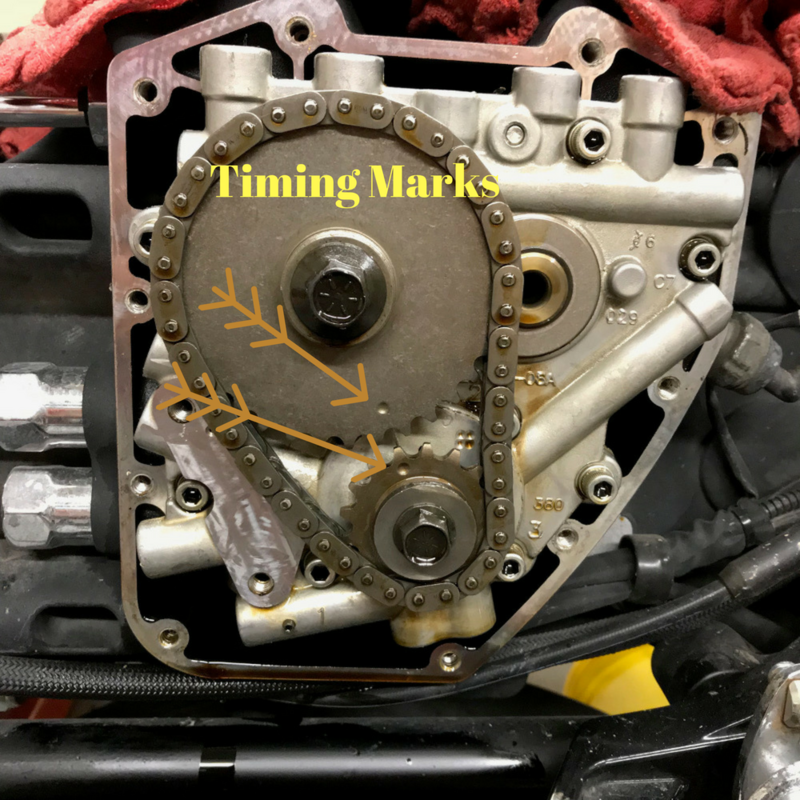 Notice the timing marks on each of the sprockets. This will become vital when timing our new cams from the kit. The two camshafts are synchronized with their own chain and tensioner. First step is to depress the tensioner and slip a paperclip into the hole of the tensioner to hold it in the compressed position. 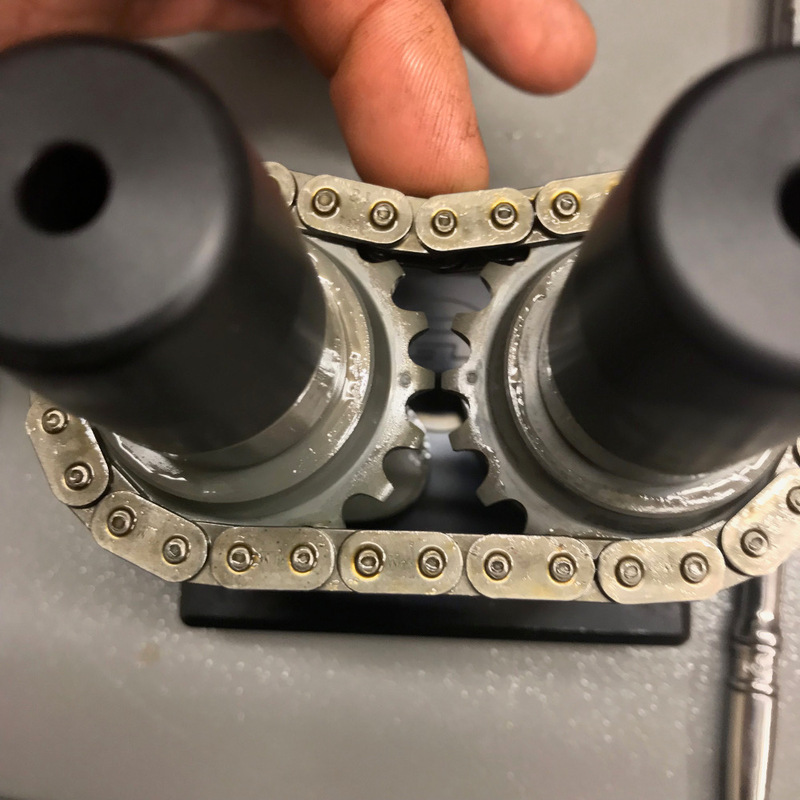 Then we remove the two mounting bolts from the tensioner, remove and set the tensioner aside. 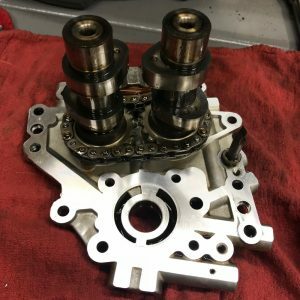 Next we lift the two camshafts with timing chain from the rear of the cam support plate. 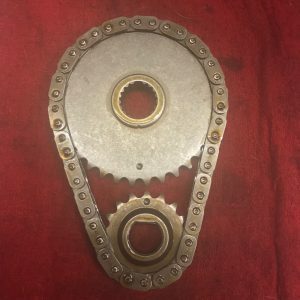 Then we can use our camshaft assembly tool from Georges-Garage Part# 320610 and build our new cams with timing chain. The tool consists of a base that holds each camshaft and two Delrin caps that protect the bearing surfaces when installing the camshafts. 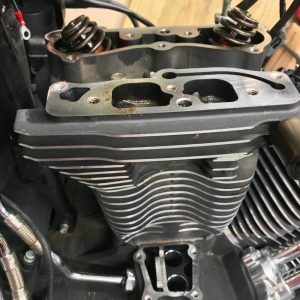 You assemble, time the cams & chain, then slide the completed assembly into the support plate, remove the caps, replace the shims and (the front cam) snap ring, and you’re done. Simple, efficient and quick. 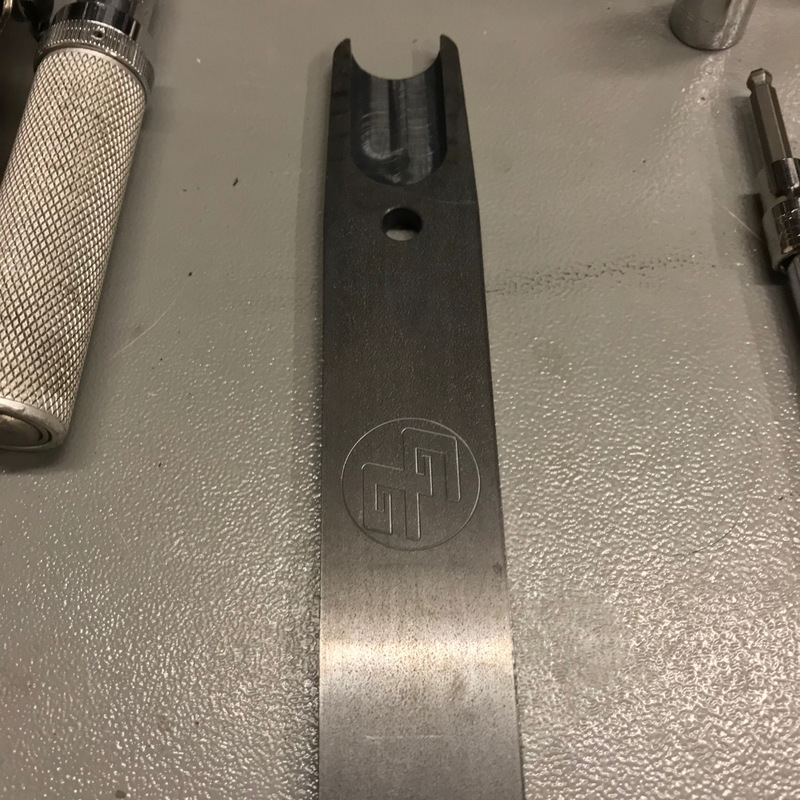 It was at this point of the tear down that I realized I needed a VERY important tool (that I’ll mention later on) that I did not have in my possession. All that remains is to remove the old camshaft bearings but that’ll come later on also. So, now, I begin the rebuilding process while I wait for a tool to be delivered. Continue to follow the next episode called “Installing the Piston’s, Rings, Cylinders and Cylinder Heads”. 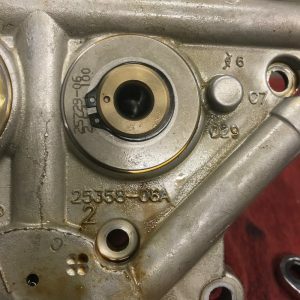 Conversion: Cylinder Heads, Cylinders and Piston Removal. Welcome to part 3 of this rebuild. To visit the previous step in the tear down, visit Conversion: Rocker Arm Support Plate Removal. 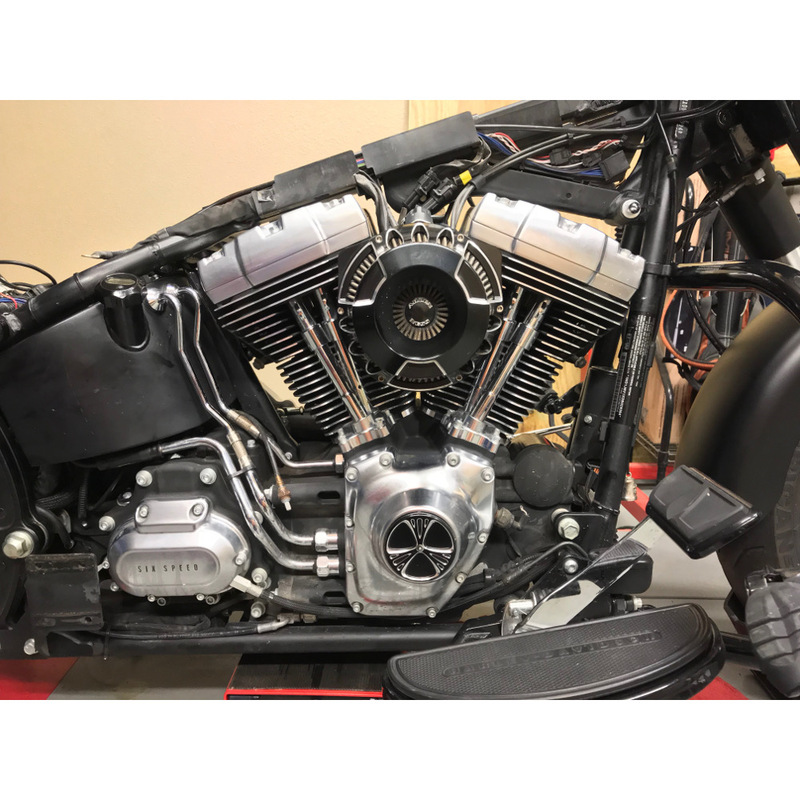 To start from the beginning, click 13′ FLSTFB Conversion to CVO 110“! 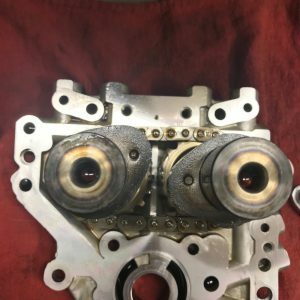 We start today by removing the Rocker Housing which is mounted to the top of each cylinder head. 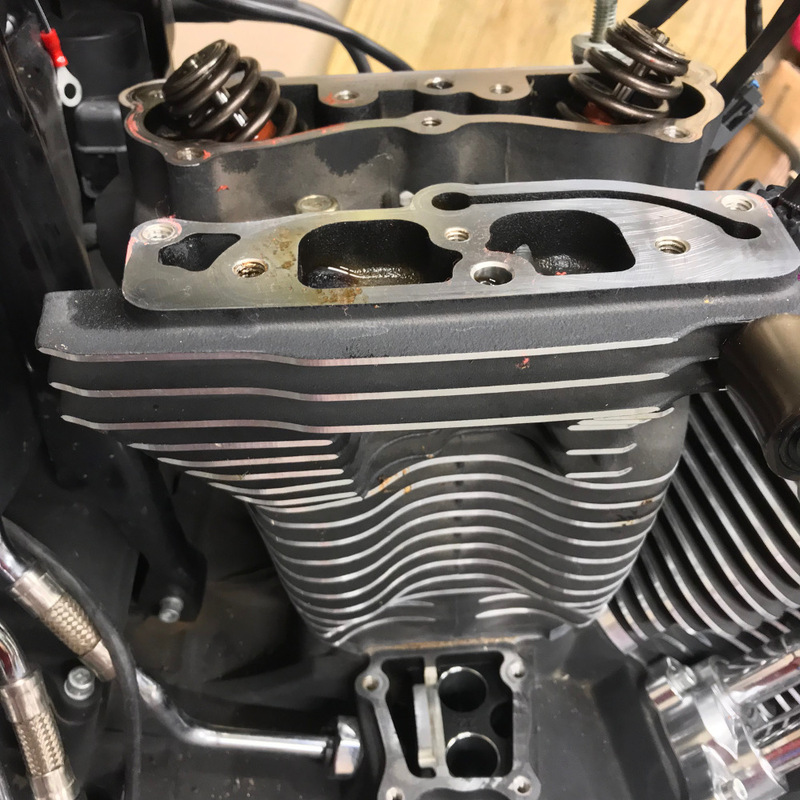 Remove the six 7/16″ head Rocker Housing bolts then lift the Rocker Housing off, clean and set aside. Next step: removing the rear cylinder head. 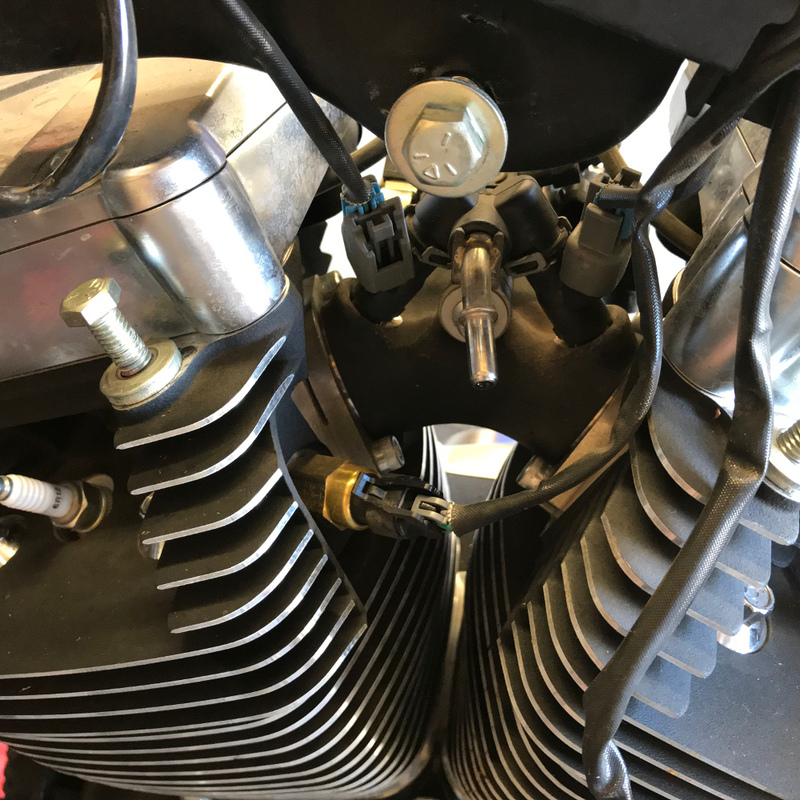 Four 12-point 1/2″ head bolts are all that hold the head onto the cylinder. 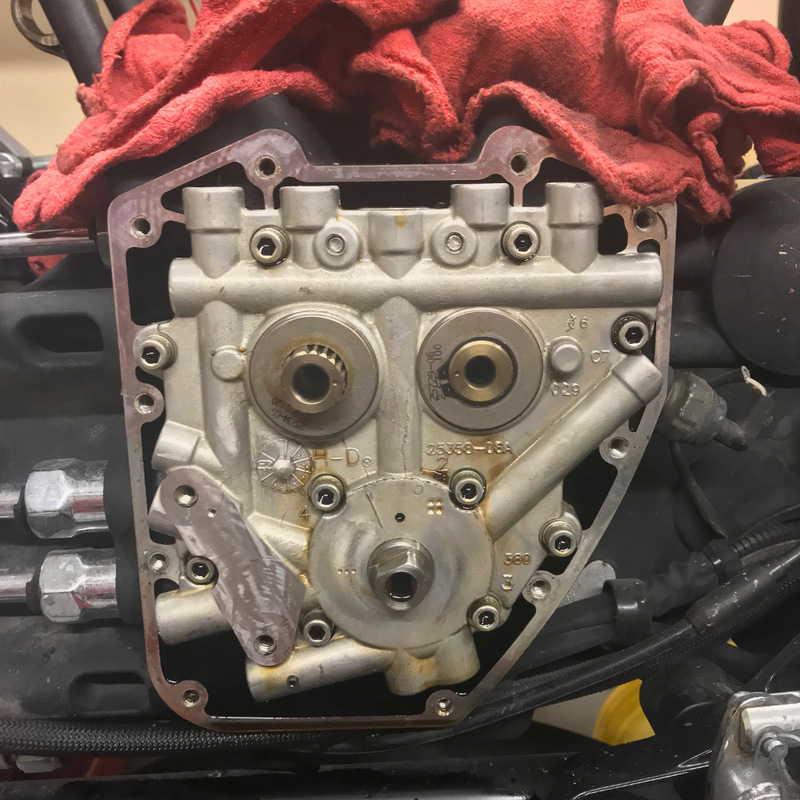 Once removed the head simply pulls off and is removed from the engine. 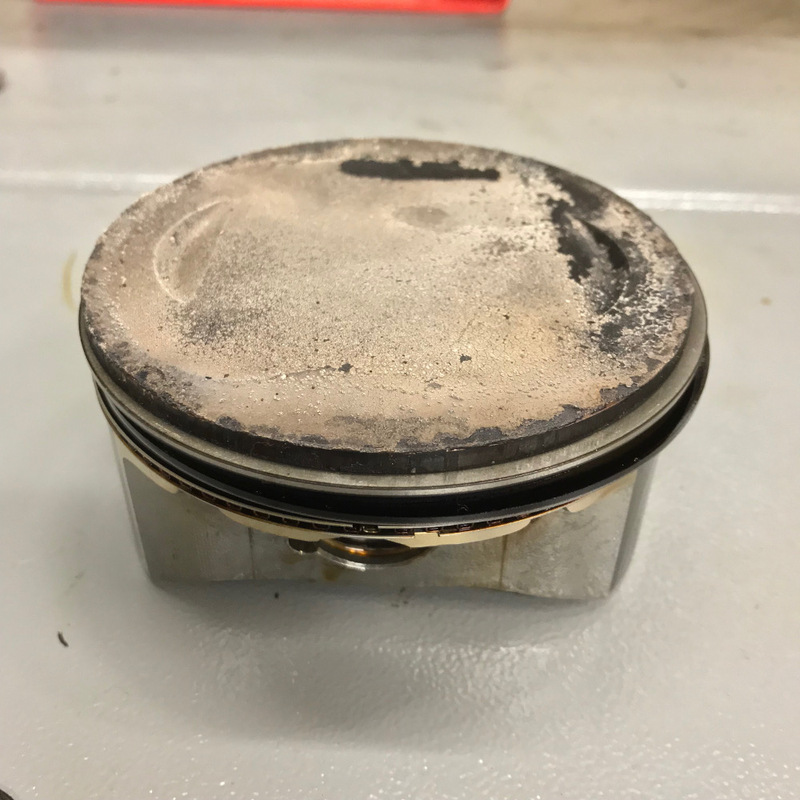 Next, with the aid of a helper, gently lift the cylinder off of the piston. 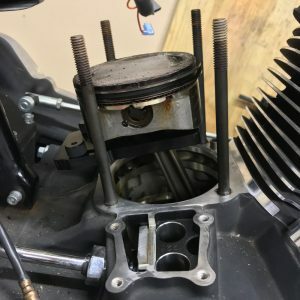 Be sure to support the piston (by the connecting rod) to prevent it from falling onto the cylinder studs. I happen to also keep four 1/2″ ID 6” long pieces of rubber hose to install over each of the 4 cylinder studs to prevent damage to them or their threads. 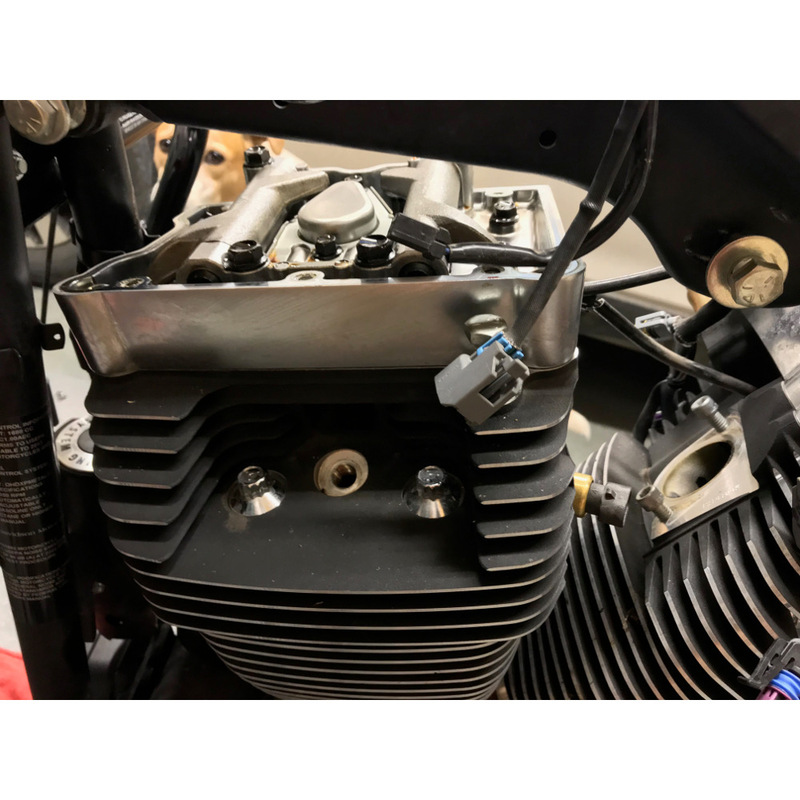 Next we’ll remove the Piston Wrist Pin Cir-Clip. Again, be certain all openings to the engine are covered or closed off. 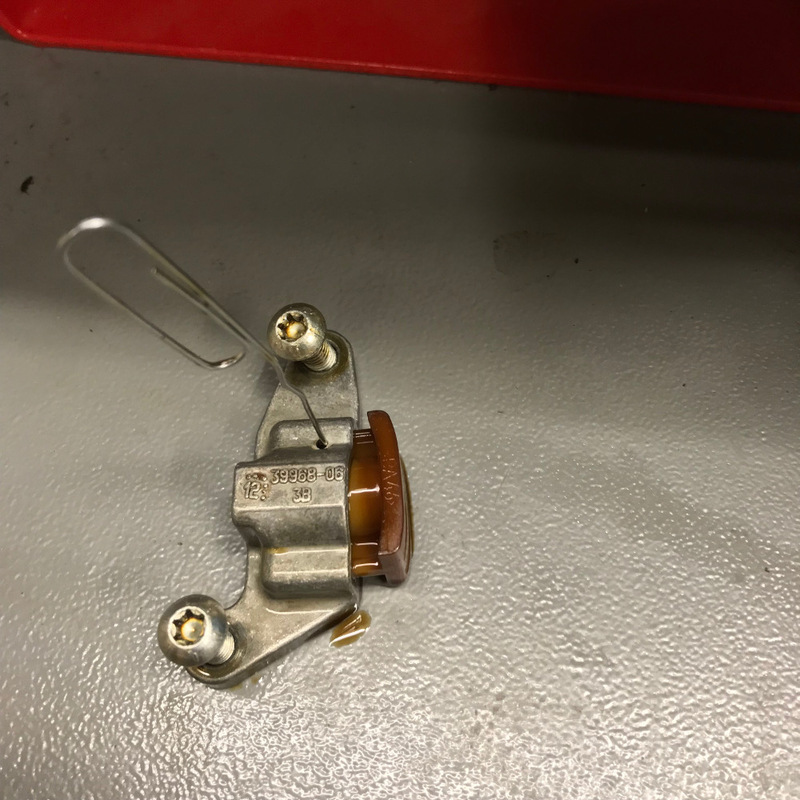 A cir-clip in the crankcase means a lucky score using a magnet or a complete engine tear down. The cir-clip can be easily removed using a pocket screw driver and a pair of needle-nose pliers. They get replaced with new parts in the kit which includes a new wrist pin as well. 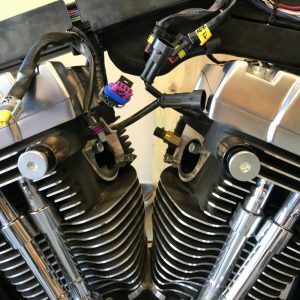 Once completed, tear down the front cylinder same as the one we just performed. Above we see the top end completely removed. Next will be Timing Component Removal. 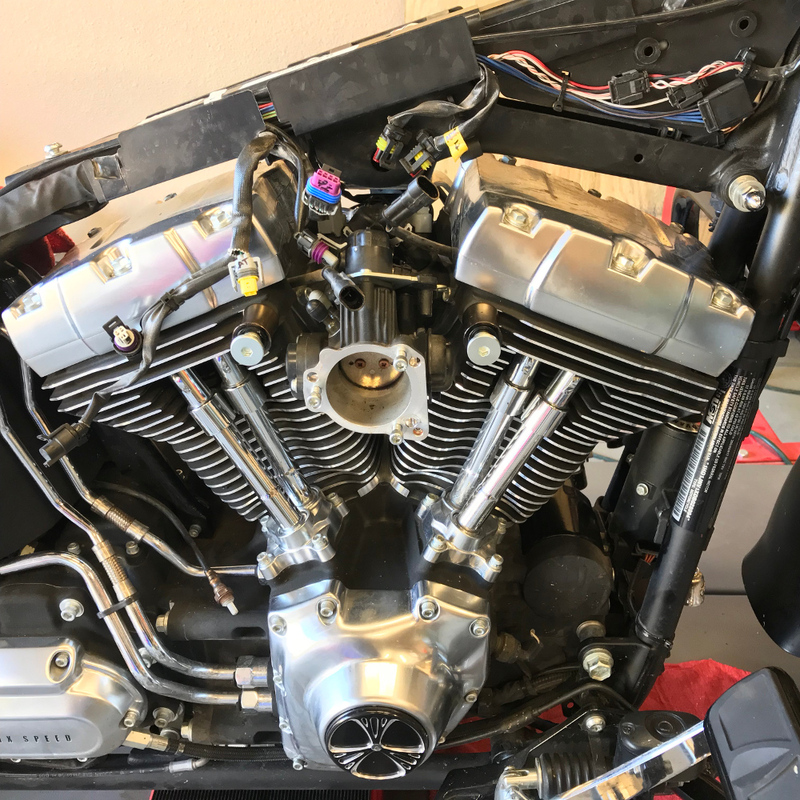 To start from the beginning of this build, check out 13′ FLSTFB Conversion to CVO 110! So the next step is to dig into the mechanical (fun) parts of the job. Up until now, it’s been just “busy work”. As you’ll see in the following photo’s, I’ll begin by removing the Rocker Box Covers. 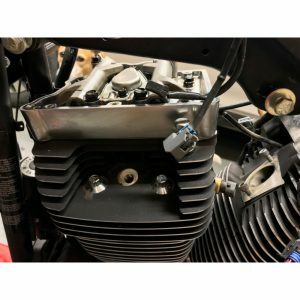 This is easily performed using a 7/16″ socket and a “Dog Bone” style extension for the bolts that are close to the backbone of the bike. 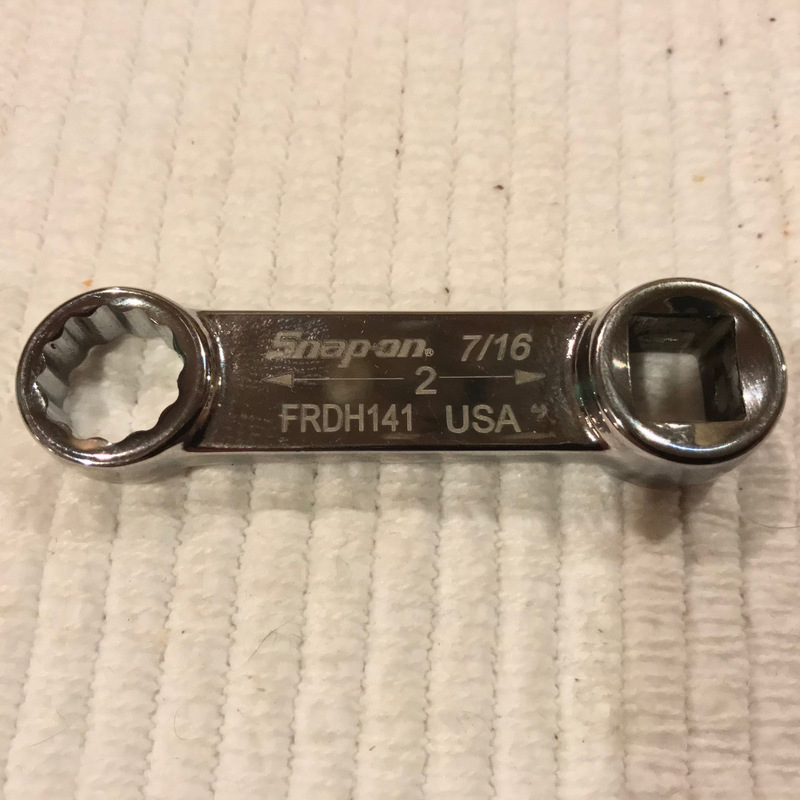 I used “Snap On” tools (part #FRDH141) 2″ extension” to break the bolts free, then I used a 3/16″ Ball Hex Allen on an extended 1/4″ drive ratchet to remove them. 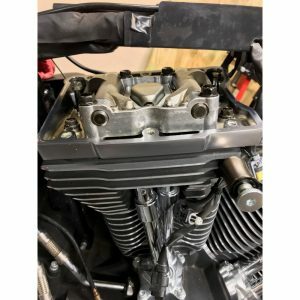 Harley Davidson’s R&D followed by manufacturing of these particular bolts makes it easy to use multiple tools to get the job done quickly, however a quality wrench will perform the same function, be it, much slower. After removal of the covers, we’ll discard the gasket as the kit comes complete with all the essential gaskets (except the primary cover gasket, which we’ll address at a later time). 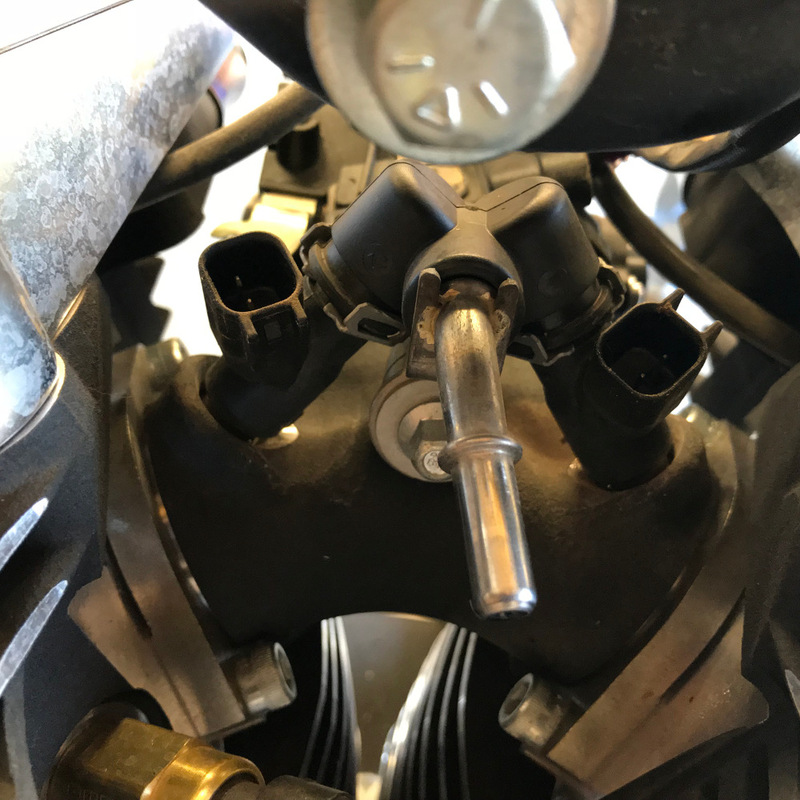 Next, we removed the spark plugs with a standard 5/8″ spark plug socket. 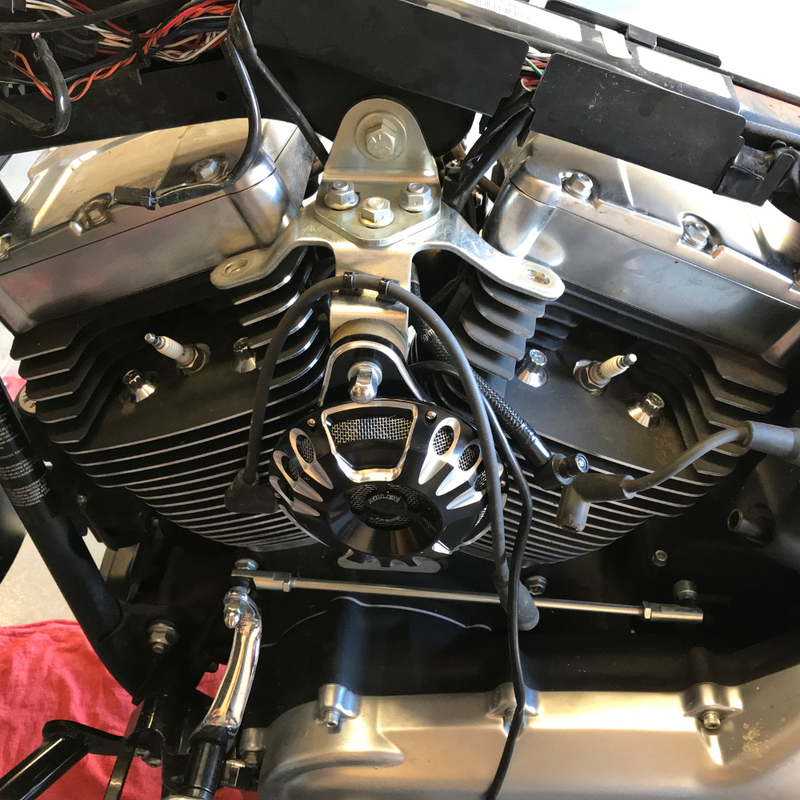 With the Rocker Box Covers removed, I begin by turning the engine over so that the rear head push rods are setting on the camshaft base circles. 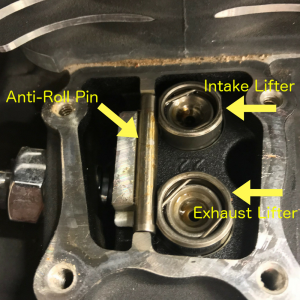 This is when both valves are closed and no tension is being applied to either the intake or exhaust push rods. 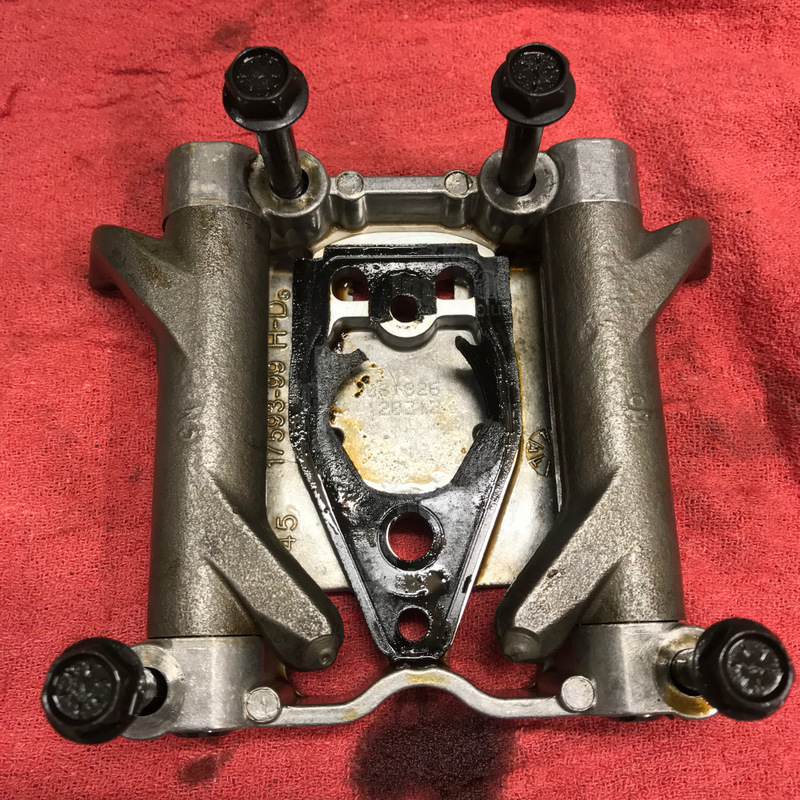 Because I have not yet removed the Primary Cover, I perform this step by shifting the transmission into sixth gear and with the rear wheel raised off of the lift, I rotate the rear wheel backwards. I can tell when the base circles are in the correct geometry by visually observing the movement of the valve springs and can see when both valves are fully closed. There’s another method to locate the base circles, which I’ll explain a little later on in the tear down. 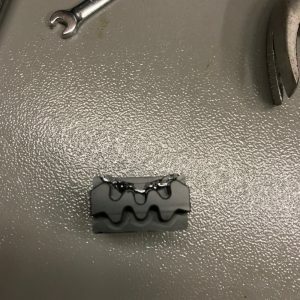 Now we can release the tension on the push rod tube covers by depressing the spring cap (using the special tool#340050), and using a small flat blade screwdriver inserted into the cast loop, slightly twist the retainer in a clockwise direction (for right handed folks) until the base of the retainer pops free and can be removed. Once completed, the tube covers can be collapsed but not yet removed. Now I’ll provide an alternate method of finding the cam base circles. 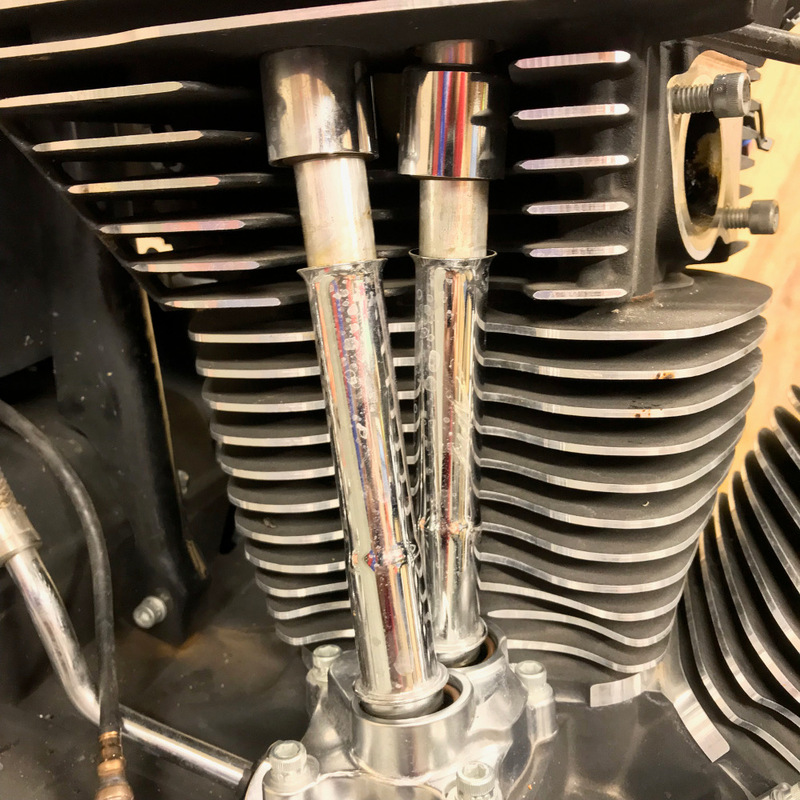 You can still spin the rear wheel backward and periodically check the tension on the, now partially exposed push rods, by reaching below the collapsed push rod covers and spinning the push rods themselves. If there is pressure on the rods, it will be very difficult to spin them between your fingers. Yes, it can be done, but if no tension is on the rods, they will spin freely. 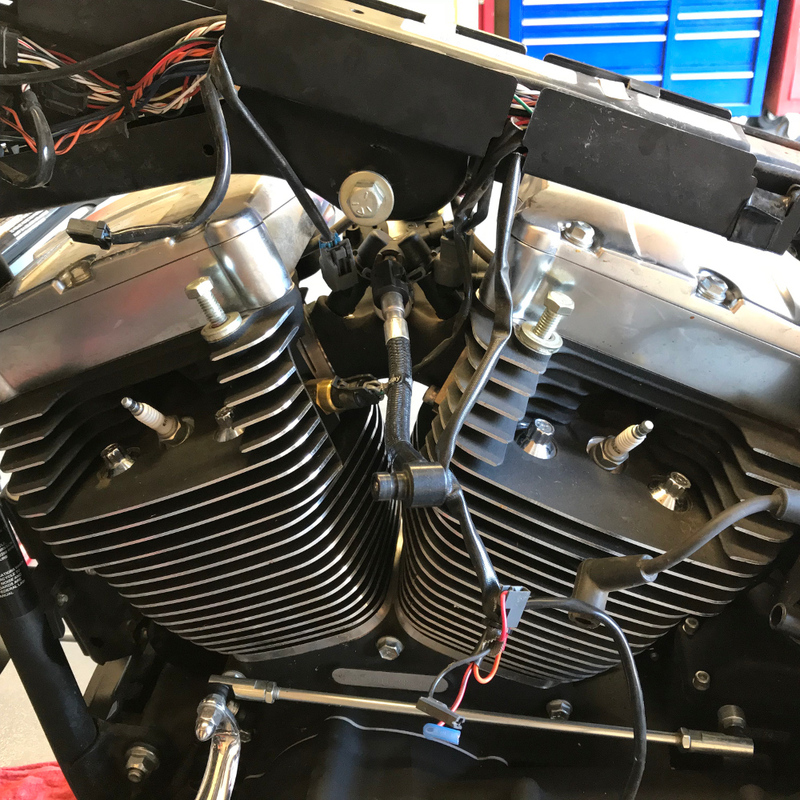 With the tension off of the rods, we can begin further disassembly. 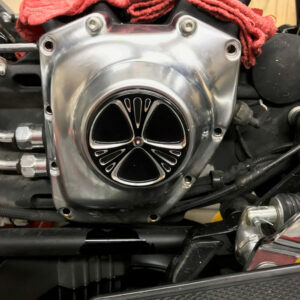 First remove the Breather Baffle assembly. 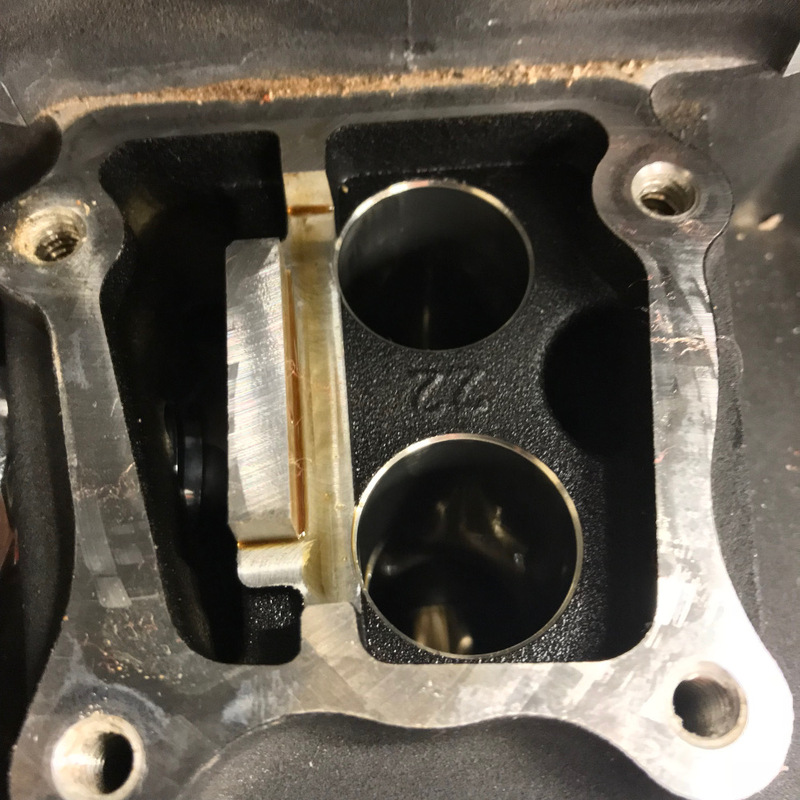 Next, in quarter turn increments, remove the 4 bolts from the Rocker Arm Support Plate. 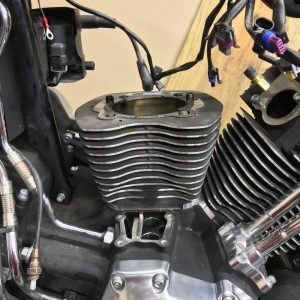 Lift the Support Plate assembly off the the cylinder head as a unit. Now the push rods are removable. It is imperative that all components be tagged for function, location and orientation. This cannot be overstated! There are subtle differences between the rods and they must be returned to their original location. 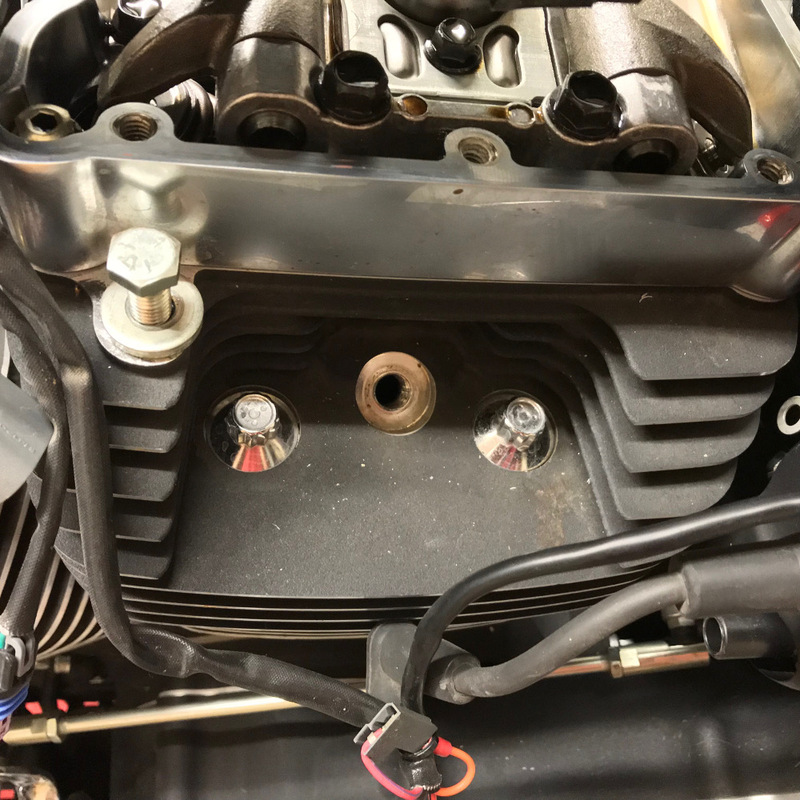 With the rods removed, we can now remove our collapsed rod covers. Be sure to remove the o-rings (3 each: 1 yellow, 2 brown) for each tube. 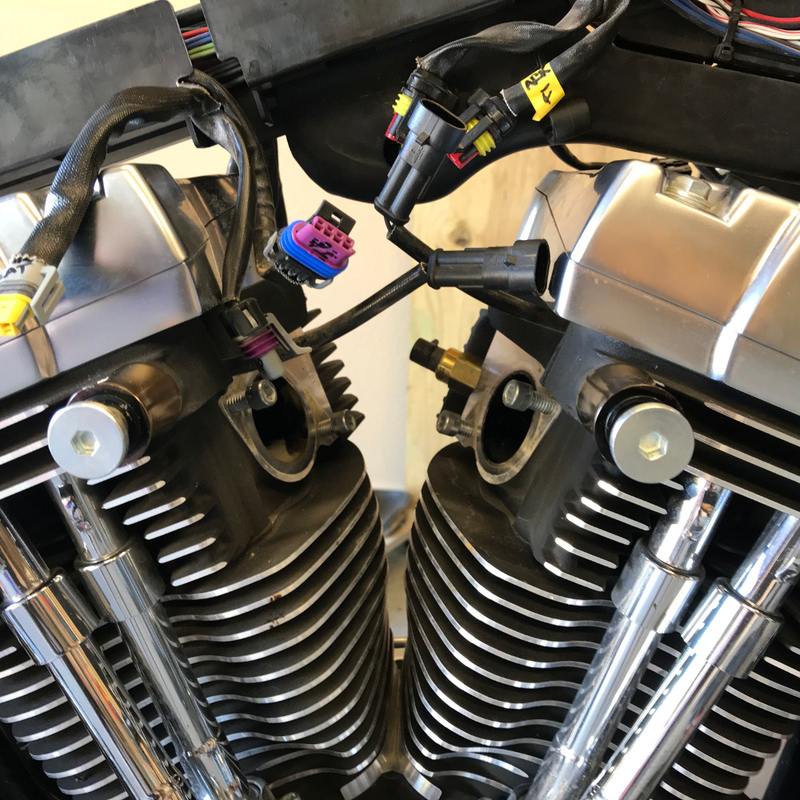 They may have come off the tubes and remain in the head or lifter cover plate. Next job will be to remove the lifter covers. 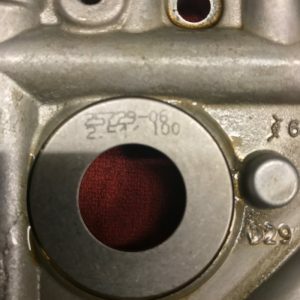 Remove the four 3/16″ Allen head screws. 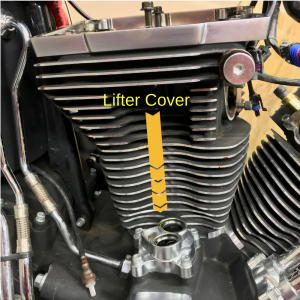 You may find that the covers are stuck to the crank case. Patience, accompanied by many blows of a soft faced mallet will yield results. They may seem like they will not release, but in time, they will. Do not pry on the covers. This will likely mar or scratch the covers and or crank case. Trust me, they will come free with a mallet! 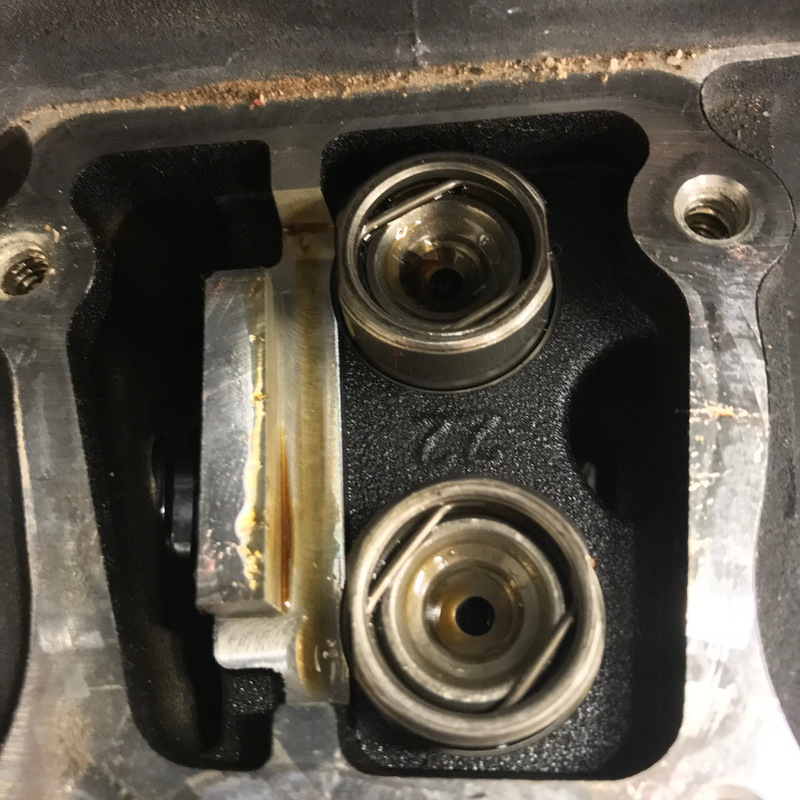 Once free, remove the gasket which will most likely be glued to the crank case. 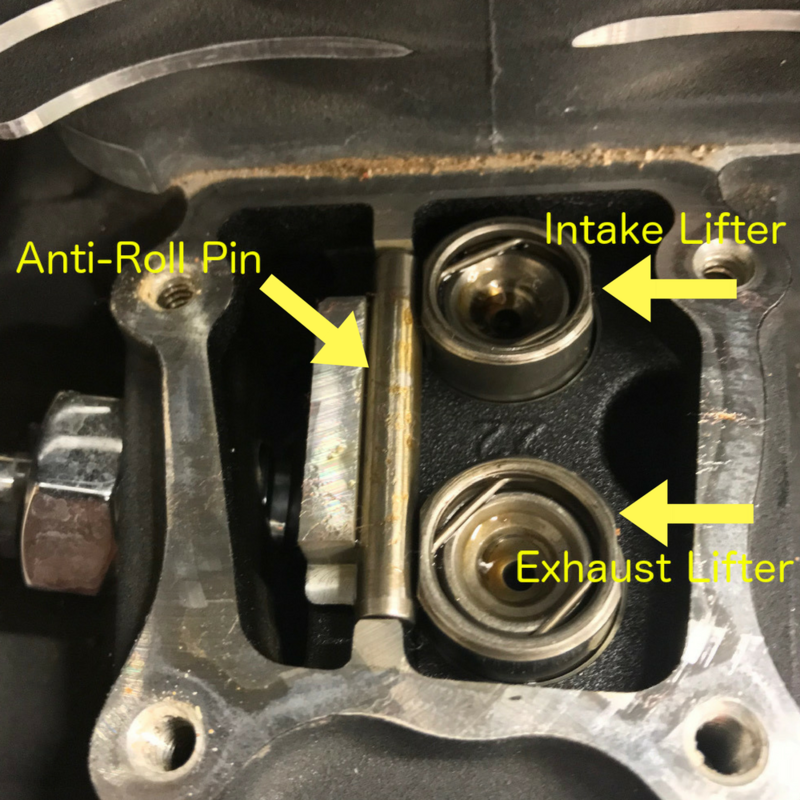 See the figure below as the next step will be to remove the anti-roll pin. It just lies adjacent to the two lifters on their respective flat spots. 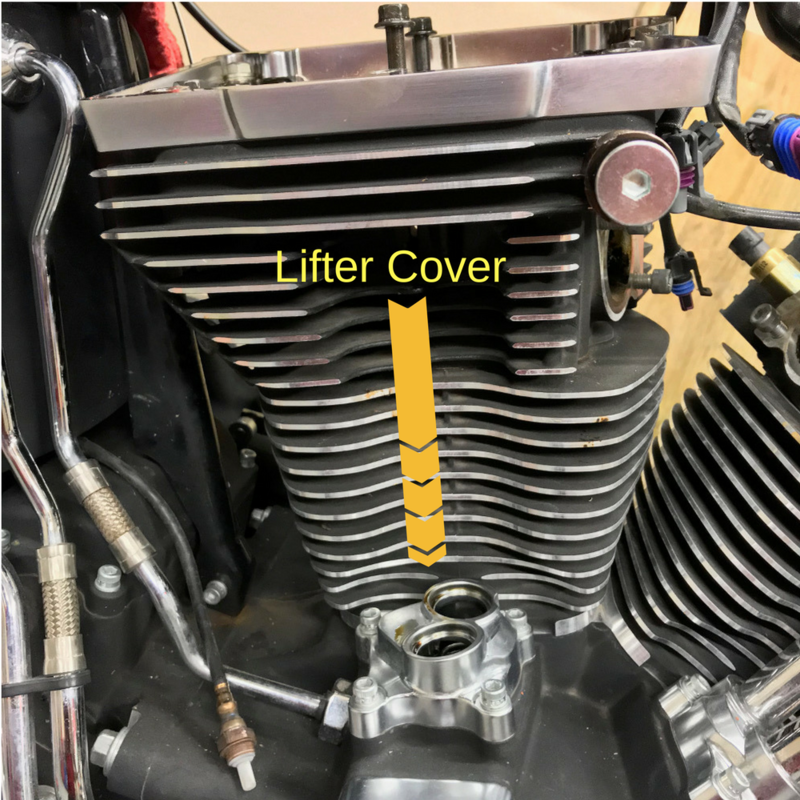 Take note of the orientation of each lifter as you remove them. A magnet such as the one on the end of a pocket screwdriver, is sufficient to pull them from their bores. Note: The lifters are replaced with new parts from the upgrade kit. The next step, one that is most important, is to cover these openings. Dropping items into these holes will result in a complete engine tear down in order to retrieve them. 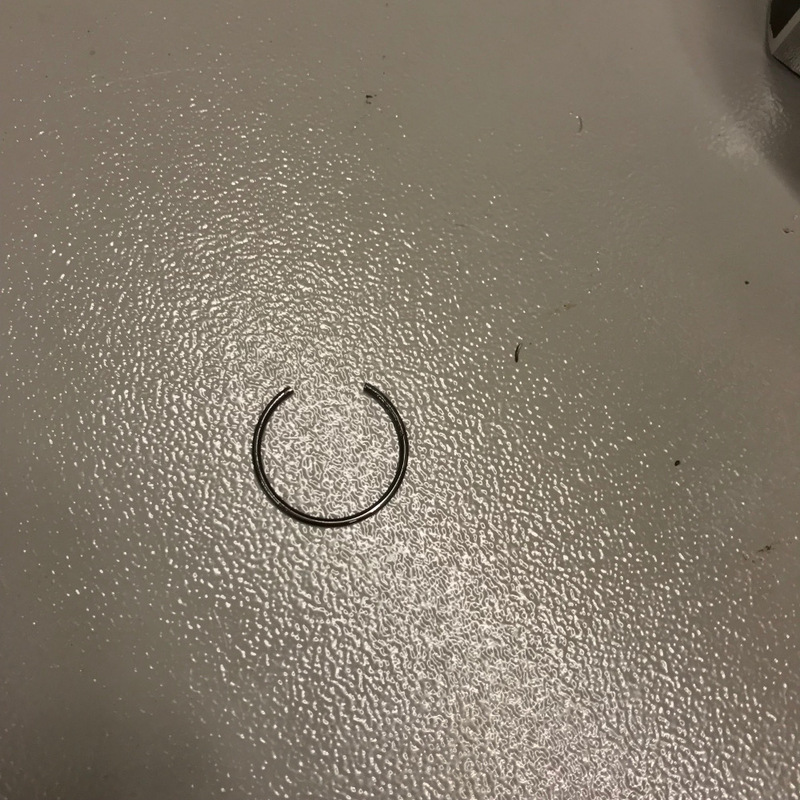 Something as simple as a rag over the top can prevent major frustration and expense because our piston wrist pin cir-clip fell through this hole. Same holds true with tools. A 1/4″ drive socket will easily fall into these bores. 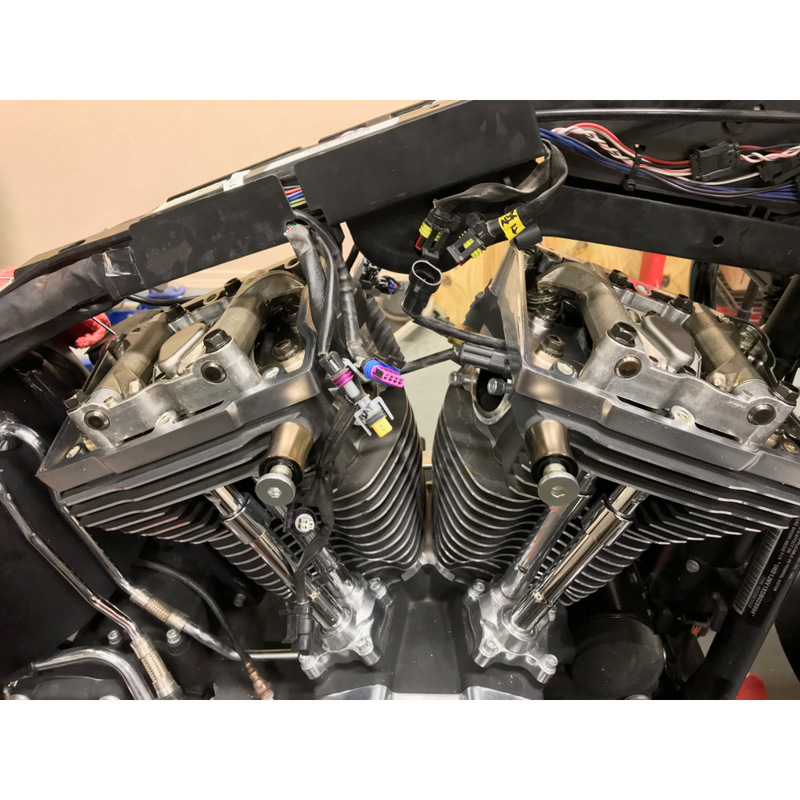 Next will be the removal of Cylinder Heads, Cylinders and Pistons. 13′ FLSTFB conversion to CVO 110! 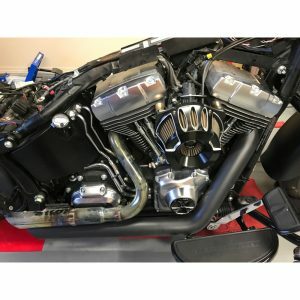 I’ve waited all summer long for today and “finally” the time has arrived to begin the transformation of my 2013 Harley Davidson Fatboy Lo! 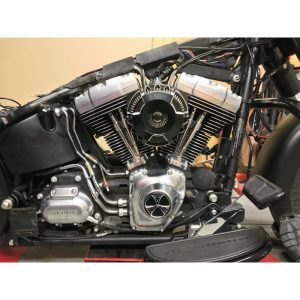 The bike came factory stock with a 103 cubic inch engine. 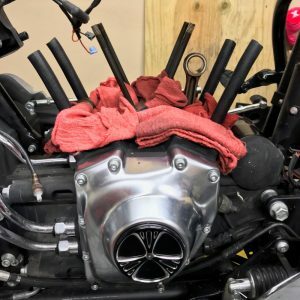 I have found that over the past 17,000 miles, mostly “two-up”, that I’d like to add some extra horsepower and torque to the bike. So this past summer, I purchased the “Harley Davidson Screamin’ Eagle Bolt-On 110 Cubic Inch Street Performance Kit”. This will bring the bike up to the same displacement and power output as the CVO Screamin’ Eagle models. 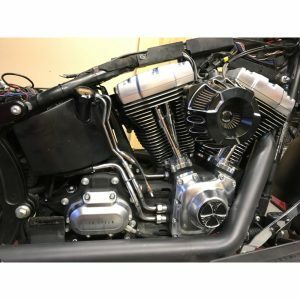 The weather has finally begun to turn cool (after a fantastic October riding month) so now is the time to begin. I’ll be posting pictures of the complete tear-down and rebuild along the way and posting comments as I go. I’ll also add an occasional video of the progress as well. A lot of planning went into this conversion. 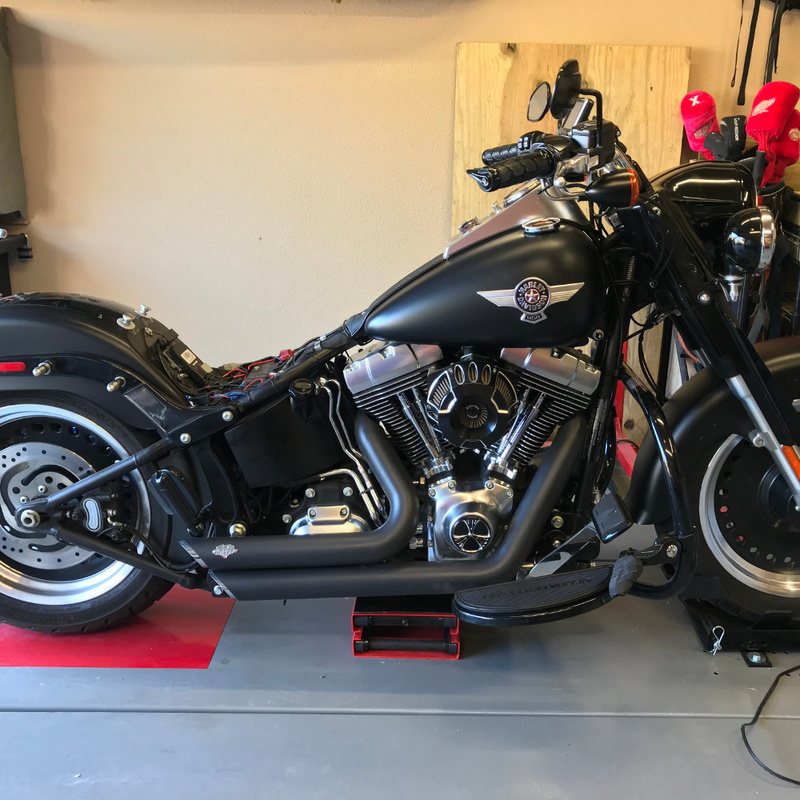 Working actively as an ASE Certified Master Automotive Repair Technician, I thought it best to invest in some specialty tools and 1st on my list was a motorcycle lift. A recommendation from a co-worker (whom currently owns one) and having visited his garage to see it in action, I took the advice and purchased a Derek Weaver lift. Let me state that having a lift to perform this conversion is not a necessity as much as a nicety. The lift I use is model TX-1000-XLT and is phenomenal. Removable side panels and a rear tire drop out makes this a fully functional and stout lift. I modified the lift slightly by not utilizing their front tire locking mechanism and immediately mounted a Condor SC-2000 Trailer Only Chock in place of it. Drive on/off without using tie-downs or Jiffy stand necessary. Any specialty tools I’ll tell you about as the project progresses. Lets get started. 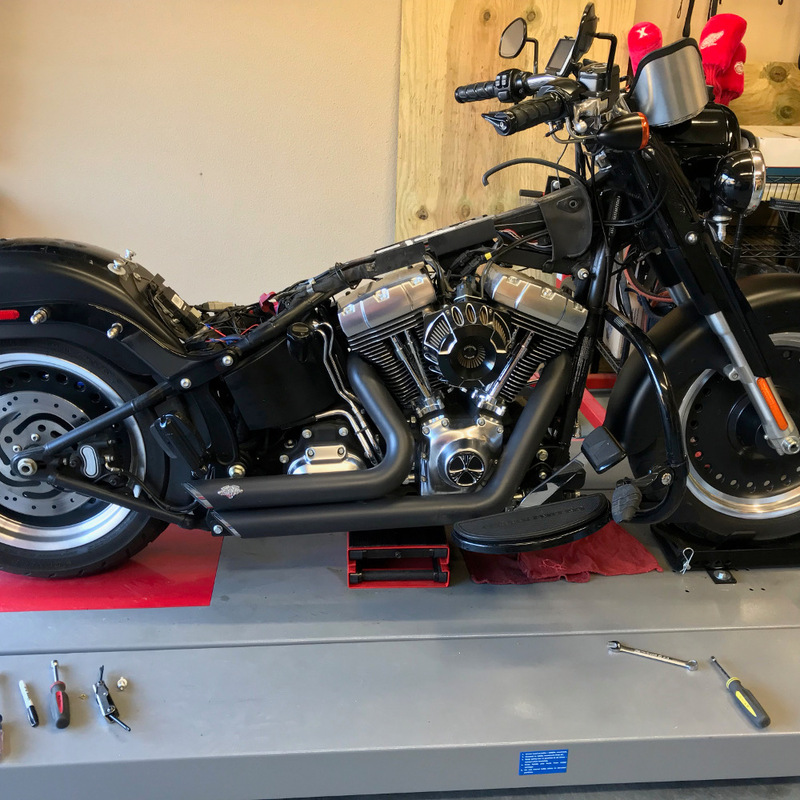 Day one consisted of removing the Windshield, Seat and Rear Fender Bib. 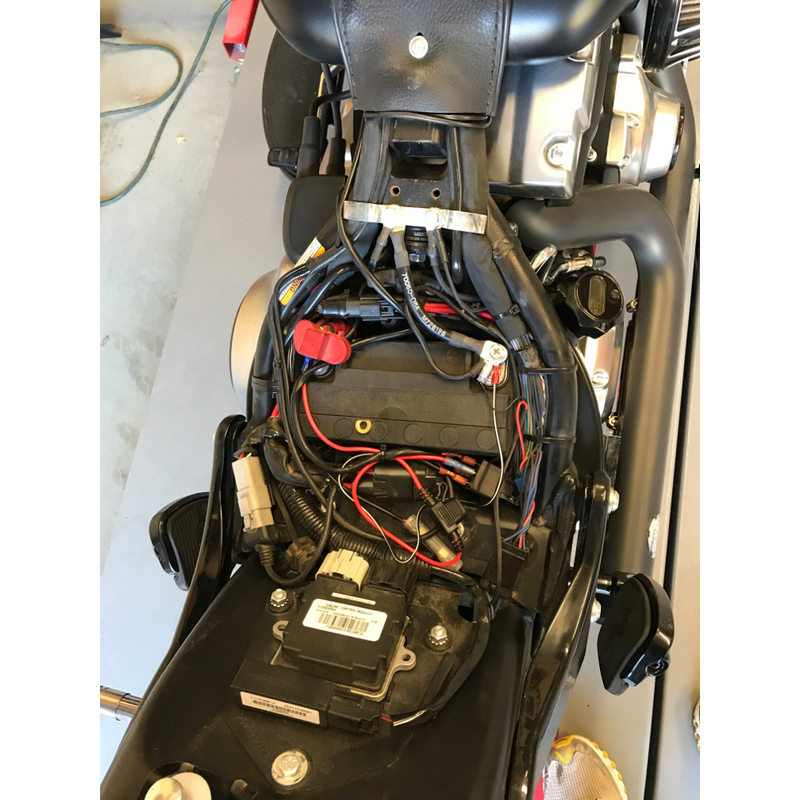 Then we disconnected the battery and removed it from it’s cradle. 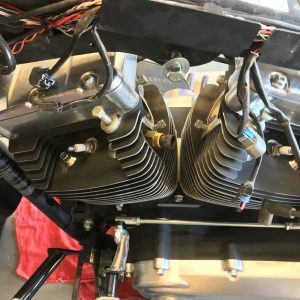 The fuel tank “Instrument Panel” gets removed next followed by the tank itself. Nothing difficult or tricky about this as it’s pretty straight forward and simple to perform. The cross-over tube that runs under the frame is held on with band clamps and can easily be removed and discarded. 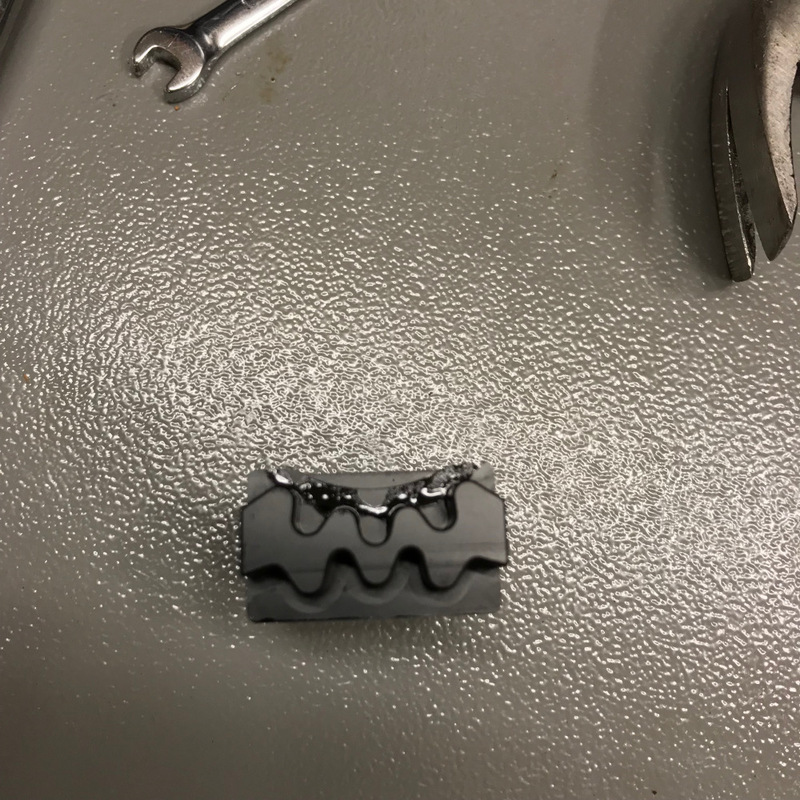 A worm clamp can be used as a suitable replacement when going back together. I then drained the tank. 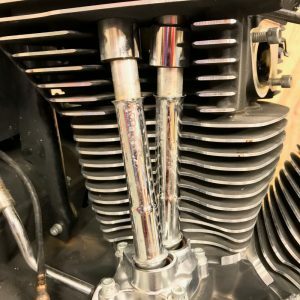 If leaving fuel in the tank and this project is going to take more than a weekend to perform, I would recommend a fuel stabilizer added to the fuel. Now the Vance & Hines exhaust system will be removed. 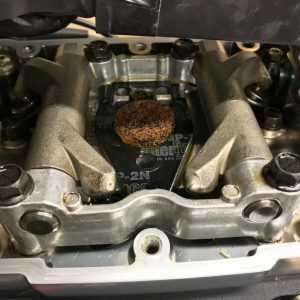 We’ll start at the rear pipe by removing it’s associated heat shiel which is held on by worm clams. 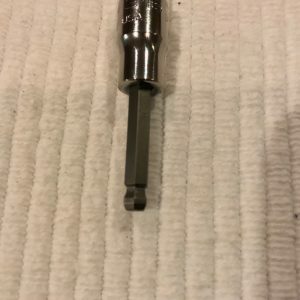 A simple 8mm nut driver will easily do the trick. 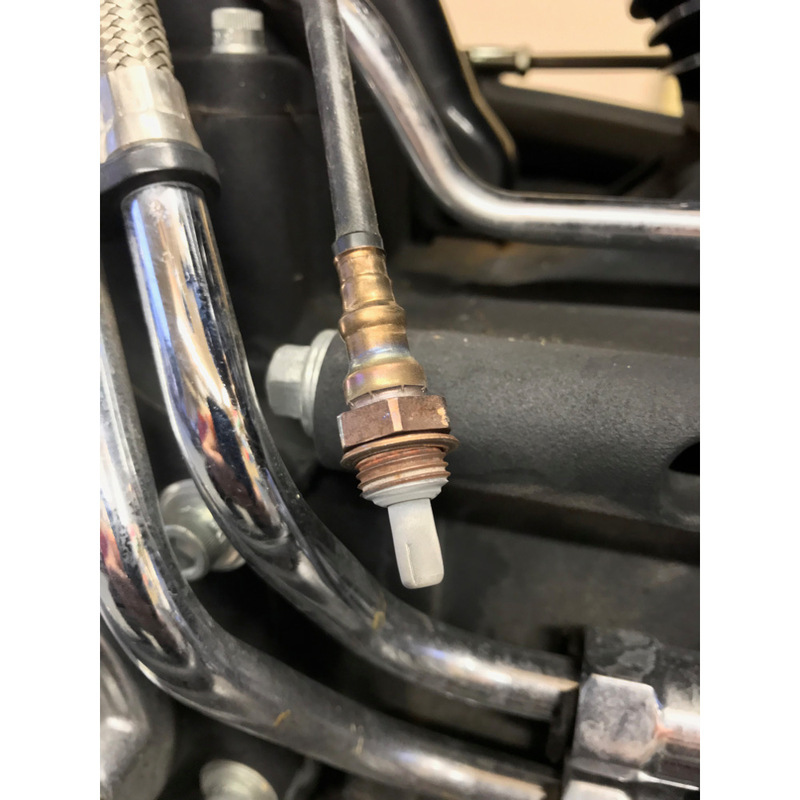 Then remove the oxygen sensor. And finally the pipe itself from the bracket on the frame and the two manifold studs. Repeat, in order, the front pipe. 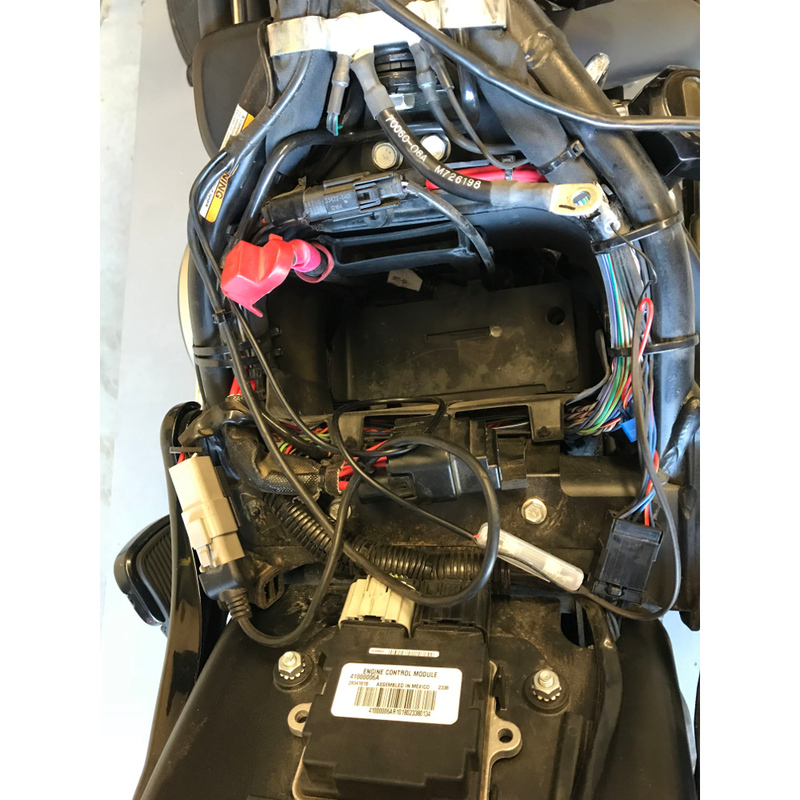 From the left side of the bike, I’ll remove the horn assembly and ignition wires. We removed air cleaner and unplugged MAP, IAT, TPS, both ACR solenoids & IAC. 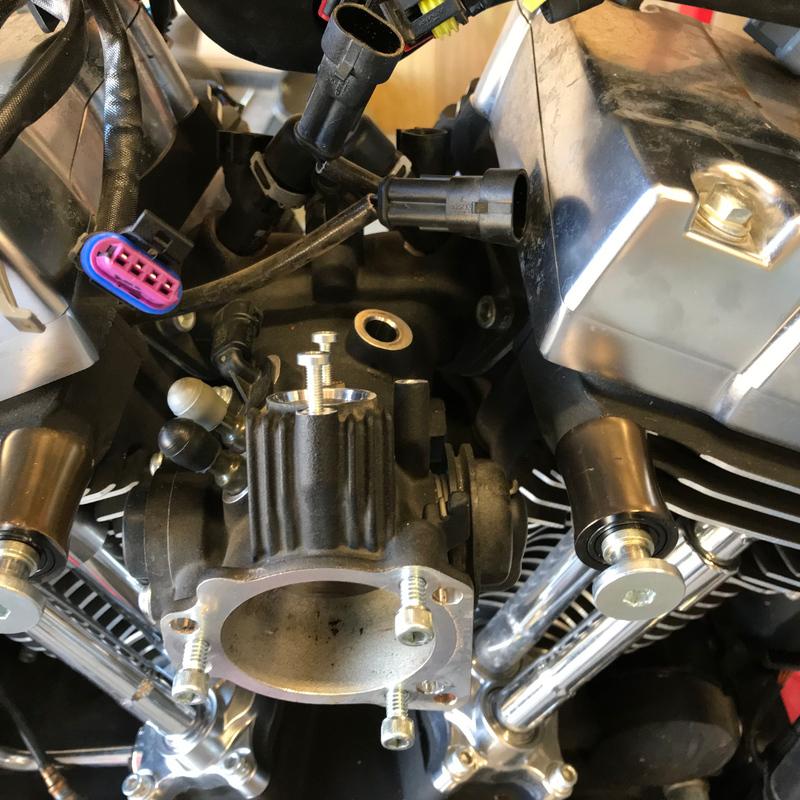 Throttle cables loosened and removed from Intake Module. 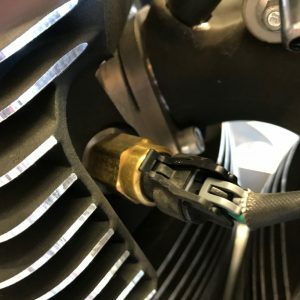 Depress the quick clip on the fuel line and remove the line. The following series of photos shows the removed IAC Motor & Throttle Cable Bracket, unplugging the Injector electrical connectors and finally removing the Intake Module. 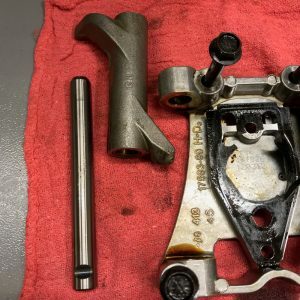 To follow my progress continue to removing the Rocker Arm Support Plate. So, the wife and I broke down and decided we needed to add a little Harley Davidson jewelry to our collections. Kerry wears bunches of HD snap jewelry while I had none. 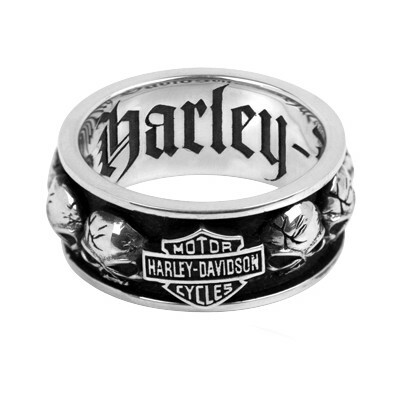 Having outgrown my wedding band (and considering cost to add gold to it), we opted to purchase new matching HD rings. Kerry continues to wear her wedding ring, and while mine does not fit my ring finger, I do still wear it as a pinky ring. But my wedding ring finger now bears the “spinning cracked skull” HD ring shown left. And “YES”, I fidget with my rings so the spinner is a must have. 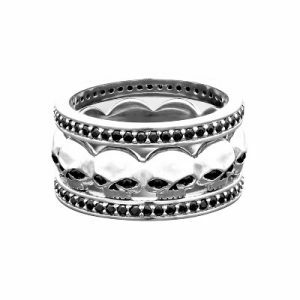 The ladies “Black Stone Skull” stacking ring is actually a three-piece design and can be worn in multiple combinations.